Workers at Gaz de France at Holbeck swapped their desks for the undergrowth and footpaths of Gledhow Woods, Gledhow, as part of the company's Energy and Environmental week. 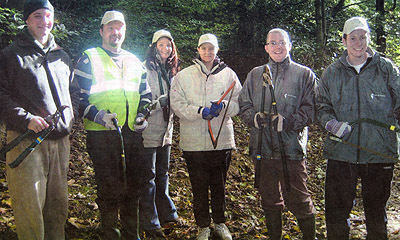 The energy supplier's staff worked on repairing footpaths and clearing foliage to encourage natural habitats for birds and mammals which also tied in with the Leeds Cares challenge at the woods. They were supported by Business in the Community which works to improve companies' impact on society. Franck Neel, head of strategy and marketing said: "As an ethical organisation, the Gaz de France Group puts the spotlight on corporate social responsibility and Business in the Community has offered invaluable support to help us achieve this." The Friends of Gledhow Valley Woods helped to organise the Gaz de France event, provided all the tools and eqipment used on the day, and arranged help from the local Ranger. Please feel free to contact us if your company might like help organising a similar event.